Pinball machine is more than an arcade game. It is a repository of classic art, pop culture and history. Its backglass is in itself an interest for many art lovers and pinheads. While the gameplays are history makers. In its more than 150 years of existence, Pinball has witnessed a large part of the modern history. And it deserves a place in museums. However, it is so great and beloved that there are museums all over the world dedicated to this game. In this list we present a rundown of 7 most popular and must-visit pinball museums in the World. The home of game and amusement, Las Vegas houses not only world wonder replicas but also the Pinball Hall of Fame Museum. Found in the museum are rare pinball machines that are real gems for collectors and enthusiasts such as Bally’s Pinball Circus, Recreativos Franco’s Impacto and Williams’ Black Gold. 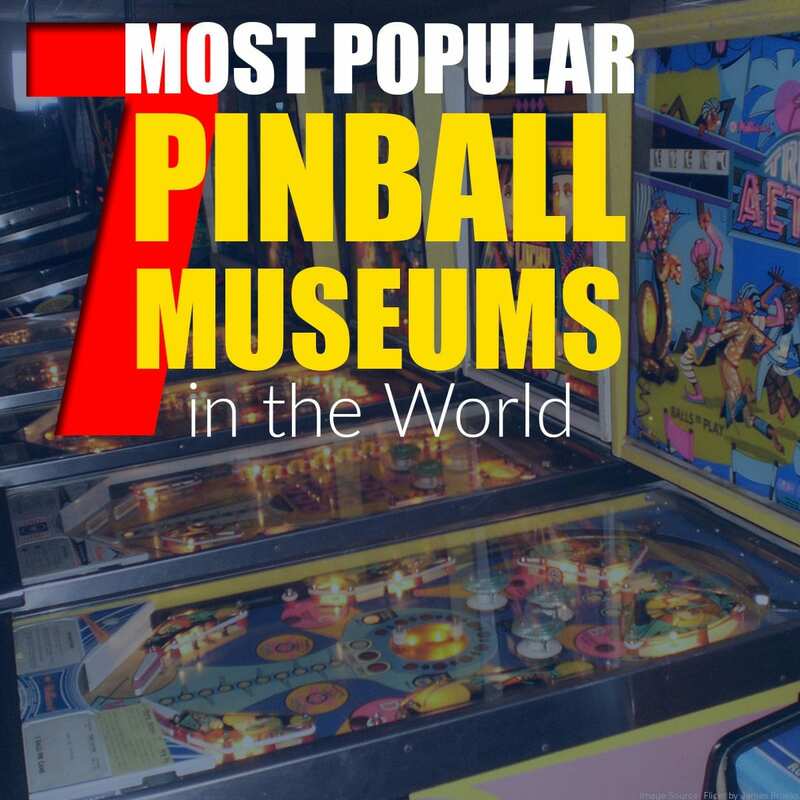 For over a decade, thousands of museum goers had seen over 200 unique pinballs in this museum along with classic arcade and video games. Apart from United States and Australia, pinball game became very widespread and popular in Central Europe, particularly in Hungary. Even during the communist era of the said country, gamers would play Pinball machines in hotels and home-turned inns. At the heart of its capital in Budapest, is the Hungarian Pinball Museum that daily caters to hundreds of visitors. This museum features 130 machines from old wooden pinball games to modern machines. What is more, visitors can try them all! The Flipper Museum in Hungary is not alone in documenting the history of Pinball in Europe. In Paris, you can visit the ‘living’ museum of Pinball where you can play classic pinball Machines such as the 1930s Gottlieb, Genco and Bally pinball machines. The first machine that will welcome you as you set foot in this place is their oldest, 1931 Gottlieb Baffle Ball. What’s good about this museum is that it is well curated: you can find them arranged by age and manufacturer. The German Pinball Museum is nothing short of featuring a treasure trove of pinball machines like those in Budapest and Paris. While not all machines are available for the visitors to play on, it houses an impressive collection of old and new, classic and popular machines. The antique that are preserved and restricted for playing makes it a real museum and not merely an arcade bar. Along with the Pinball Museum in Paris, the collections are curated or grouped by age and or manufacturer. You can find their collection of Gottlieb, Data East and System 11 games and more. The Seattle Pinball Museum is a brainchild of a community of Pinball collectors who wanted to share the games to the locals and showcase the art behind pinball machines. It started as a project in Storefronts Seattle program. The Museum was chosen by ten artists as a creative enterprise for a 3-month grant. Now it is a permanent in the community. It features vintage machines from 1934 machines to present day classics. With an entrance fee of less than $10 visitors can try them all! If you’re really into vintage pinball machines and interested in its history, then you should visit the Pacific Pinball Museum in Alameda California. It is a museum of the history of pinball and displays machine as far back as 1879. Michael Schiess, the director of the museum owns about 800 machines, and 90 of which are displayed in the museum gallery. The star of their collection is the 1879 Montague Redgrave Parlor Bagatelle along with art deco machined from the 1930s. Last but not the least is the Museum of Pinball in Banvilled California. It is indeed not the least among the ones listed here as it is considered the biggest Pinball Museum in the world. It has about 900 in its collection, 600 of which are pinball machines and 300 are classic arcade games. It houses one of the oldest, if not the oldest, Pinball machines still existent–the 1855 pinball machine. What is more, visitors can play it!